An latest career advertisement designated as an ERDO recruitment has been published by the Education Research and Development Organisation. Before the deadline of October 18, 2018, the skilled and well-qualified competitor needs to fill the application form by reaching online mode from its official website for 13634 posts of Basic Teaching Teacher, Block / District Education Controller. 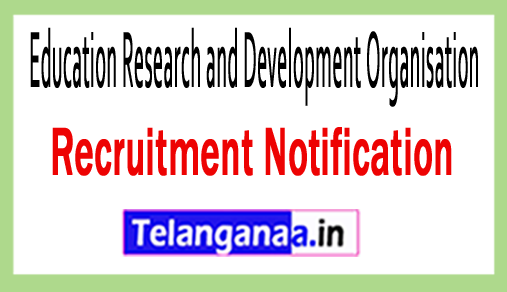 Job Apple, who want to apply for the ERDO jobs and read detailed ads about ERDO recruitment 2018 from this page created by the team of www.telanganaa.in. Academic Description: Candidates should have a Bachelor's degree / BEd / BTC / BP.AD / D.Ed. / NTT / PTT / M.Ed / MA / M.Phil / PhD as per the post from the well recognized University / Institution. Candidates applying for the above post and belonging to the general / OBC category, they have to pay the application fee. 450 / - (Post 1), 600 / - (Post2, 3). Interested candidates belonging to SC / ST category will get Rs. 250 / - as Application Fee (Post 1), 400 / - (Post2, 3). Candidates interested in interested PH category will get Rs. 250 / - as Application Fee (Post 1), 400 / - (Post2, 3). Salary details: After qualifying the selection process, the participants receiving shortlists should get Rs. 10,500 / - (post 1), Rs. 18,450 / - (post 2), Rs. According to organization norms, 26,200 / - (post 3). The engagement of the candidates will be based on their performance in the merit list, which will be conducted by the recruitment committee of the Education Research and Development Organization. Visitors have to go to the official website to apply for the ERDO and it is http://www.erdo.in. Online registration of the application is open date: 16-09-2018. The last date for submission of online application form is: 18-10-2018. Click ERDO recruitment notification here.